‘Oh, you should eat more of it, sis. Fruits are mentioned many times in the Holy Quran, and of course, we all know the benefits of vitamins that come with them, mashaAllaah’ I told her. And the health benefits, we all know about it, right? Shoo, Dr. Shoo…I have an apple in my hand! I remembered an email send by a dear friend from Shaw University Mosque one day about the amazing resemblance of the shapes of the fruits and the actual benefit that those fruits carry. Celery, Bok Choy, Rhubarb and more look just like bones. These foods specifically target bone strength. Bones are 23% sodium and these foods are 23% sodium If you don't have enough sodium in your diet the body pulls it from the bones, making them weak. These foods replenish the skeletal needs of the body. Eggplant, Avocados and Pears target the health and function of the womb and cervix of the female - they look just like these organs. Today's research shows that when a woman eats 1 avocado a week, it balances hormones, sheds unwanted birth weight and prevents cervical cancers. And how profound is this? .... It takes exactly 9 months to grow an avocado from blossom to ripened fruit. There are over 14,000 photolytic chemical constituents of nutrition in each one of these foods (modern science has only studied and named about 141 of them). Sis Zabrina, also known as Zabrina A. Bakar, is a Life Storyteller, motivational and inspirational writer and speaker; and author of Islamic motivational book Life is an Open Secret http://www.lifeopensecret.com. She maintains an active blog at http://www.wisdomthruwords.blogspot.com. salaam..a nice story that makes me feel want to eat fruit now..tq! Oh, please do. They are among the gazillions of blessings Allaah has sent our way, alhamdulillaah! Subhanallah...what a perfect of Allah's creation. All are created in balance and have functional roles. Really those who are like to see and think will get the benefit. There are many secrets in the Allah's creation that we have to discover....mainly through science. There are many science investigations that proved the truth of Al-Khaliq, the Quran, the Prophet SAW. In this article, the medical benefits from the fruits are related with the morphology of the fruits, and of course science had proved it through chemical analysis. subhanallah, masyaallah! How great Allah's creation. every fruit has dofferent kind of acid. So, it is not good to take more than one type of fruit at one time. Salaams t_msa, you are so right. There are too many of His creations that we could ponder upon, if only we take the time to pause and ponder! And alhamdulillaah, modern science has given us the tools to prove what was revealed 1400 years ago, subhanAllaah! Salaams anonymous, jazakAllaah khayran for the information! I didnt know that we should avoid eating multiple types of fruits at any one time. That was amazing...I had never correlated the two...its amazing, but not beyond belief...Almost every day we see one more reason of why its great to be a Muslim and how lucky we are to acknowledge that ALLAH is the one and only. I agree with you. I was totally flabbergasted too the first time i read the email from my dearest friend. SubhanAllaah, we are indeed fortunate to be able to say There is no god but God! Assalamualaikum, this is a very good post indeed. What I read last night had reminded me to buy some fruits from pasar malam today. 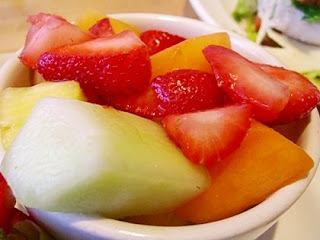 The best thing about this post is when you share the benefits of fruits interconnecting with their physical appearance. I would like to know if there are any connection for other fruits and vegetables also. Please allow me to link this post to a blog that I administered for the purpose of passing the message. Sorry..i forgot to put the link..
You know sis, if all of our scientists and education ministry focus our learning and research into discovering and developing science from the hadeeths and the Quran, I think that many explanations and discoveries are able to surface from the sunken treasure of the past Islamic civilization.